... I ran, everyday, for a week. Technically, I ran five days in a row, but at least that's every"week"day. I skipped Saturday and gave up Sunday after less than half a mile because it was already mid-day, and I haven't re-mastered the mid-day thing yet. Still, considering I barely ran at all after September when I got burned out, I feel pretty good about my week of running, though my legs were admittedly not the happiest. I ran about 18 miles in total over those five days (18.5 if you count the weekend), which is not much, but it's a post-partum mileage peak. Of course, most of those miles were run in the cold of the morning, which is kind of cheating to me, since that's a heck of a lot easier than logging on the treadmill, which is my only viable option on some days. Of course, I got sore. Who wouldn't? My stomping grounds are hilly, and this was a lot of sudden impact even though I do a lot of interval training. My runs were 3-4 miles, which is about as far as I can go right now before a joint starts bothering me, which started happening often post-partum. My shoes are new, so I either need to stretch more or take glucosamine again. Pace-wise, it wasn't pretty. I run with an app but haven't been pausing it when needed, so I'd hover between 9:30-10:30 on the road and 9:05-9:30 on the treadmill. I'm not particularly interested in running faster, except that I am trying to maximize the 30-40 minutes I have to work out. As for "the itch," well, I would LOVE to finally run half-marathon #30 or even a 10K, but I've yet to find anything specific yet, nor am I really anticipating getting into half-marathon form anytime soon. I *think* Baby Tuesday is finally starting to sleep more reliably at night, which has helped me make progress in the insomnia spells I've developed on top of that, but who knows? I will say, though, that the relatively decent sleep lately is definitely playing into my ability to do any kind of running streak, and it really has made a difference in my outlook on things. Next month, "The Ukrainian" is running two of my favorite/sentimental races -- Surf City Half-Marathon and LA Marathon -- and even the itch for those is pretty tame. I know I'm in a different chapter of my life right now, and I can enjoy running short distances for its own sake for the time being. That's actually a very good place to be, for me. Happily, after this week of pounding, I ran again today (Monday). If things continue to go well, I might average a mile a day this month -- I'm at 21.5 and have six days to do the last 9.5. That would be a nice, doable goal for the remainder of the year... tougher when you started for the month on the 18th. Back in June, I did a 30-Day Squat Challenge that was, frankly, quite empowering. It was the first fitness-related thing I've been able to commit to since -- probably even before I had or carried a baby. I had not been able to commit to training schedule. But why? I'm going to guess here: along with life changes -- longer commute, changing work hours, availability of gyms, moving, etc., I think I just could not stay motivated. I've completed many marathon training cycles, the Insanity (60 days!) program twice, some other stuff like the 100 Push-Ups Program... and I think I just got burnt out. Since I bought it, I tried to complete Shaun T's other fitness program, Focus T-25, on two separate occasions, never making it past the first two weeks. One of these attempts was pre-baby. This gives me a pang of shame, because the workouts are only 25-minutes long. I mean... really?! But then I factor in getting dressed, getting cleaned up, finding a place to work out, and the affair could take close to an hour. I don't know why I didn't feel like I didn't have an hour back then, especially now that I have a little guy who really makes me value and savor my time more. I'm supposed to be completing a cycle finally this year -- we'll see how that goes! So when I was asked to review this book (15 Minutes to Fit), I thought I'd just summarize it and move on. I've never done any of the Bodyrock.tv workouts that the main author, Zuzka Light, publishes. But I was getting kind of tired of using the elliptical or doing random videos all the time and thought that this would be an exercise in willpower to attempt to complete the 30 workouts in this book. I mean, if I couldn't do 25 minutes, what about 15? I didn't even need to pop in a DVD. I looked through the book and thought there was a lot of talk about motivation and recipes before it got to the workouts part, though I think for most people, that works. I wanted the cut-to-the-chase approach and flipped straight to Day 1. The evening that I received the book, I planned to do Day 1 the next day to see how many of these I would do and just kept going. The workouts themselves require no equipment, except a mat if you're on a hard surface. 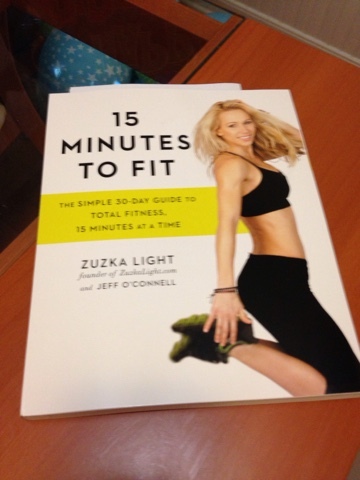 There are 4-5 moves that you do continuously until your 15 minutes are up. Sometimes, the focus is the whole body, but some of the days place particular emphasis on a body part, and it got brutal on the days that it was upper body. Many of the days, these were the longest 15 minutes of the day, either because it's that intense or I am that out of shape, or maybe because I usually did these in the morning when I'm most tired. It was also a mental exercise to remember how to do all of the moves and count reps -- simple stuff, but when you're doing something different every day (and putting the workout on your phone screen that keeps turning off instead of a Post-it like a normal person should do), it becomes that way. It took me 36 days to complete the challenge, and that was only because I had to take six days off when I got a stomach virus. Otherwise, I went at it daily (13 days in a row and then 17 days in a row), which definitely flexed my motivation muscle and will hopefully fuel more challenges in the future. Like always, I did not change my eating habits at all. With the holidays in there, I admit I could have done better here. Anyway, as for what I thought of the workouts... they are no joke! Some of the moves are pretty advanced and require more coordination than I had. Also, I don't want to do anymore burpees for a while after this. The good news is, 15 minutes were all that was required, and many days, that's all I gave. Other days, I'd add in 10-15 minutes of other cardio (elliptical, treadmill), but generally I let this be my primary workout for the sake of time and effect. In the end, I do feel like I did get more agile and a bit stronger (especially upper body! ), so I'm glad I gave this a shot. I also ended up using my "lonely home gym" more in the process! FTC Disclaimer: I received a review copy of this book and was not compensated to provide any particular opinion about it. A couple of months ago, I wrote a post about Baby Tuesday's first birthday. I used to think that I'd be "in the clear once" he turned one -- no more pumping (YAAASSS), better sleep (not particularly), laid-back and varied feeding (in much higher volume and forget about trying to eat in front of him what you won't share), more self-reliance and -entertainment (can anyone say 20-lb+ koala who requires a book be re-read 10+ times???). I'm learning that there continue to be challenges that gave me as much insecurity, worry, and frustration as the baby days. Sometimes I miss being able to have him just lay there for a diaper change rather than fight, or being able to strap him in a bouncy chair to turn around to grab a pot for a second and not find him staring at a puddle of tea of the floor. And oh, the tantrums/whining... I've had to start actually flexing my parenting and patience muscles rather than just "keep the baby alive" mode. But then, he will pull the mail out of the mailbox when I ask him and help me load/unload laundry. He will do things just because they are funny to him, like hide in my closet or dance, and those little things make this stage so amazing. The baby days were hard, and what I've experienced of the toddler days so far have been hard in their own right. Now, I'm really starting to believe when parents of older children/teens talk about how difficult things are, even at those stages. I also can see that it does go by as quickly as they say.